Only a few days left to get covered by February 1st! Less than 3 days remain before the deadline for people to sign up for coverage at HealthCare.gov that will begin on February 1st! Call 1-800-318-2596 or visit localhelp.healthcare.gov. Sign up by January 15. For 2016 coverage that begins on February 1, you must sign up by the January 15 enrollment deadline. Coverage could be more affordable than you think. About 8 out of 10 people who enroll in health coverage through HealthCare.gov qualify for financial help to make their monthly premiums more affordable. Most people can find plans with premiums for less than $75 a month after tax credits. Shop and save. If you had coverage through HealthCare.gov for 2015, you should come back to update your information and compare your options for 2016. You could save money by switching to a new plan. Last year, returning consumers who shopped and switched plans saved nearly $400. Make sure to review your options by visiting HealthCare.gov. Getting covered is easier than ever. Every year HealthCare.gov finds new ways to make signing-up simpler. You can even apply on your tablet. During the last open enrollment period, it took most people about 10 minutes to submit an application. Free help is available. If you have questions about signing up or want to talk through your options with a trained professional, free help is just a call or click away. Call 1-800-318-2596 or visit localhelp.healthcare.gov. 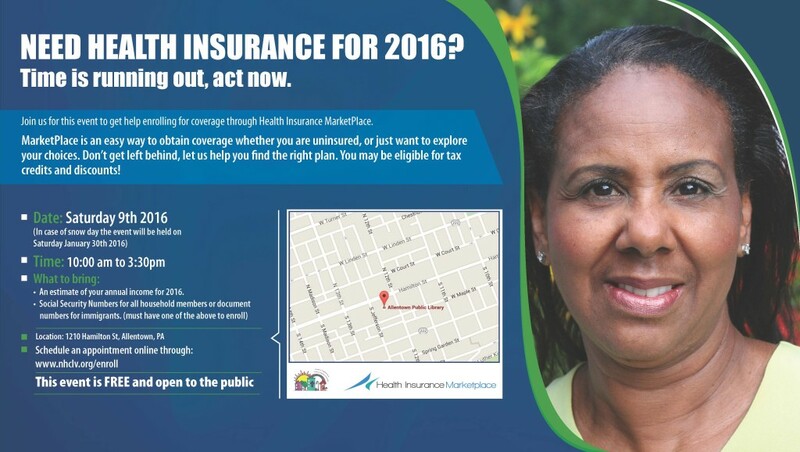 NEED HEALTH INSURANCE FOR 2016? JOIN US THIS WEEKEND IN ALLENTOWN! If you have clients and/or know healthcare consumers near Allentown who need health insurance, please be aware that this Saturday, an insurance enrollment event is being held at the Allentown Public Library. The event is FREE and open to the public, from 10:00am to 3:30 pm. Consumers can receive in-person assistance with exploring insurance options, estimating tax credits, and enrolling in Medicaid or health insurance offered through the health insurance Marketplace. Walk-ins are welcome, or individuals can schedule an appointment at: http://www.nhclv.org/enroll/. This event is made possible by the extraordinary partnership and organizing efforts of: Pennsylvania Health Access Network; Neighborhood Health Centers of the Lehigh Valley; Planned Parenthood, Enroll America; 484 Beyond; Sacred Heart Healthcare System; Advocacy Alliance; Pennsylvania Association of Community Health Centers; Cities of Bethlehem and Allentown; Allentown Public Library; Allentown Health Bureau; Mental Health Association in Pennsylvania; and Northampton Community College.